Currently hold a full-time faculty or administrative appointment in an ACEN-accredited program. Previously held a full-time faculty or administrative appointment in an ACEN-accredited program and now holds a part-time faculty or administrative appointment in an ACEN-accredited program. Held a full-time faculty or administrative appointment in an ACEN-accredited program and is retired for no more than two years from this position. Held a full-time faculty or administrative appointment in an ACEN-accredited program and then held a part-time faculty or administrative appointment in an ACEN-accredited program and is retired for no more than two years from the part-time position. Knowledge of postsecondary and/or higher education; curriculum and instructional methods; current issues in nursing education and practice. Expertise in communication, group dynamics, information literacy, use of technology, best practices in educational and clinical settings. Contributions in scholarship/research, practice, community service, professional service. Knowledge of current nursing practice, contemporary issues in healthcare settings, transition of new graduates into nursing practice. Expertise in communication, group dynamics, information literacy, use of technology, best practices for patient health and safety. Contributions in scholarship/research, practice, community service, professional service. We encourage you to self-nominate or nominate nurse educators and nurse clinicians/practitioners to serve as a peer evaluator. Please fax your nomination to ATTN: Peer Evaluator, (404) 975-5020. All peer evaluators are selected through mechanisms and criteria established by the ACEN. Individuals identified by staff, nominated by a colleague, or self-nominated must submit a letter of interest, current curriculum vitae/resume, and a letter of recommendation. 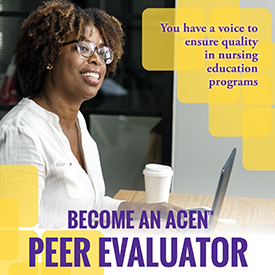 After ACEN staff review of submitted materials, selected individuals will be invited to become peer evaluator and must participate in the peer evaluator professional development offered by the ACEN. Peer evaluators are eligible to serve for an indefinite period of time if they receive ongoing positive site visit performance evaluations and remain current with the accreditation process. • Retires may continue to serve up to two (2) additional years if she/he remains current in nursing education and the accreditation process. • Is no longer affiliated with a nursing education program or nursing service will be ineligible to continue as a peer evaluator. • Accepts a position in a nursing program not accredited by the ACEN will be ineligible to continue as a peer evaluator. Peer evaluators are evaluated by the members of the site visit team and the nursing education unit following each site visit. Briefing sessions are conducted by telephone conference call for all peer evaluators prior to the assigned visit each accreditation cycle. An honorarium will be provided to the peer evaluator after a visit is completed. Members of the ERP and alternate members are program-specific and appointed by the Board of Commissioners. The ACEN professional staff review candidates based on information from current members of the ERP, peer evaluators, Commissioners, and accredited programs and recommend their names to the Board of Commissioners. Members of the ERP and alternate members must be eligible peer evaluators. Members of the ERP serve for a three-year term and may be appointed to a second consecutive term. Alternate members of the ERP may serve indefinitely. Panel vacancies are filled by program-specific peer evaluators selected from the list of alternate members. Members of the ERP are expected to participate in a briefing session held to orient new Panel members and update the continuing Panel members. Members of the Appeal Panel must have knowledge of and experience with the peer-review process. The nurse educator and nursing clinicians/practitioners members must be currently eligible peer evaluators. Commissioners cannot serve on the Appeal Panel. The Appeal Panel consists of individuals drawn from a Board of Commissioners-approved list of the individuals qualified to serve as members of the Appeal Panel. See ACEN Policy #10 Appeal Process and Submission and Review of New Financial Information Subsequent to Adverse Action.